Spend the 24th (Sat) exploring nature at Cape Breton Highlands National Park. For ratings, where to stay, more things to do, and tourist information, read our Ingonish tour planner. Memphis, USA to Ingonish is an approximately 17.5-hour flight. Traveling from Memphis to Ingonish, you'll lose 2 hours due to the time zone difference. Traveling from Memphis in June, expect Ingonish to be colder, temps between 61°F and 46°F. Finish your sightseeing early on the 27th (Tue) so you can travel to Baddeck. Change things up with these side-trips from Baddeck: Highland Village (in Iona), Glenora Inn and Distillery (in Mabou) and Cabot Links Golf Course (in Inverness). There's still lots to do: take an in-depth tour of Alexander Graham Bell National Historic Site, add some adventure to your tour with a kayaking and canoeing tour, stop by Baadeck Yarns, and take in the dramatic scenery at Uisge Ban Falls. To find ratings, where to stay, maps, and more tourist information, you can read our Baddeck trip itinerary builder. Traveling by car from Ingonish to Baddeck takes 2 hours. Plan for slightly colder nights when traveling from Ingonish in June since evenings lows in Baddeck dip to 38°F. Wrap up your sightseeing on the 29th (Thu) to allow time to travel to Sydney. Sydney is a population centre and former city in Nova Scotia, Canada. 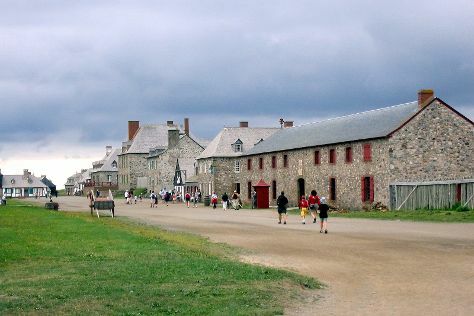 Change things up with these side-trips from Sydney: Miner's Museum (in Glace Bay) and Louisbourg (Louisbourg Lighthouse & Fortress of Louisbourg National Historic Site). There's still lots to do: explore the activities along Bras d'Or Lake, enjoy the sand and surf at Black Brook Beach, don't miss a visit to The Big Fiddle, and wander the streets of Meat Cove. To find reviews, other places to visit, more things to do, and more tourist information, go to the Sydney travel planner. Traveling by car from Baddeck to Sydney takes an hour. Traveling from Baddeck in June, plan for somewhat warmer nights in Sydney, with lows around 46°F. Wrap up your sightseeing on the 2nd (Sun) early enough to travel back home.